Anti-jam mechanism for trouble-free operation. X-Acto Personal Electronic Stapler - Use personal electric stapler for consistent, jam-free stapling of up to 20 sheets at a time. Uses standard staples. No cartridge required. Easy push-button front-loading. Throat depth is 3/8. 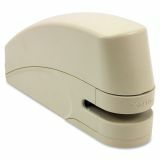 Electric stapler holds 210 standard staples." Front loads a full strip (210) of 1/4" standard staples.